This is a list of all ministries not specifically mentioned elsewhere. If you are interested in helping, please click the link below. If you'd like to solicit the services of one of these ministries, please contact the office. Are you struggling with an addiction that is really bothering you? There is a Christ centered recovery group that meets once a week at the church building. Classes for adults of all ages are offered on both Sunday mornings and Wednesday nights. The goal of these classes is to strengthen each members' relationship with their Heavenly Father, while also allowing for an open discussion atmosphere. This ministry meets once a week in order to get together and enjoy fellowship with our brothers in Christ. Basketball games are played along with a time of devotion and prayer. All skill levels are invited to join. This ministry assists with various indoor and outdoor needs around the building. This includes maintenance and repairs, flowers, decorations, weeding, mulching, mowing, and locking/unlocking the building. If you enjoy being a part of children’s education OUTSIDE of the classroom, this would be a great place to serve. This committee oversees the curriculum for children ages Birth – 6th Grade. Some of the ways to help serve with this team include: finishing curriculum tubs for the 2 & 3 yr old class, help maintain tubs each month, as well as print, punch out materials and make copies for teachers prior to class. If sharing the love of learning with children is a passion of yours, then this would be a great place to serve. We are always in need of teachers and helpers willing to help each quarter teach classes from Cradle Roll thru 6th Grade. If you’ve wanted to serve in this capacity and are not sure how to get started, then you may consider co-teaching with someone, where you partner with someone to take turns teaching and assisting for the quarter. There are fun activities outside of church for kids in 3rd grade up to Junior High age. This class is for all young adults of college age. Some of us are in college, some of us are working, and some of us are doing both. Our goal is to have a real and intimate relationship with God, and grow closer to each other in the process. Our Sunday morning class consist of Bible study and discussions accompanied by video and/or book series studies. We also get together for occasional social events centered around food and fellowship. Our mission purpose is one of community outreach to families. We provide opportunities for members to bring in visitors as a way to introduce them to the Brookline family. Our two main annual events are Spring Fling (Easter egg hunt and kite fly) and Trunk or Treat at Halloween. We are in charge of organizing the "change cans" coin drive. We'll help distribute, pick up, and deliver to the Children's Home. We will accept other donations and deliver them for you. Everything you need to become debt free! Financial Peace University is a nine-lesson class taught by financial expert Dave Ramsey that will teach you how to take control of your money. We use videos, workbooks, the best digital tools and a personal budgeting app. Classes can be taken with a group or online at home. The purpose of this group is to establish a safe place where people can help deal with the pain and loneliness that is brought on by divorce. This is not a dating network or singles group. Instead we have become a group of friends that get together once a month to share experiences, offer strength, hope, and have a little fun! 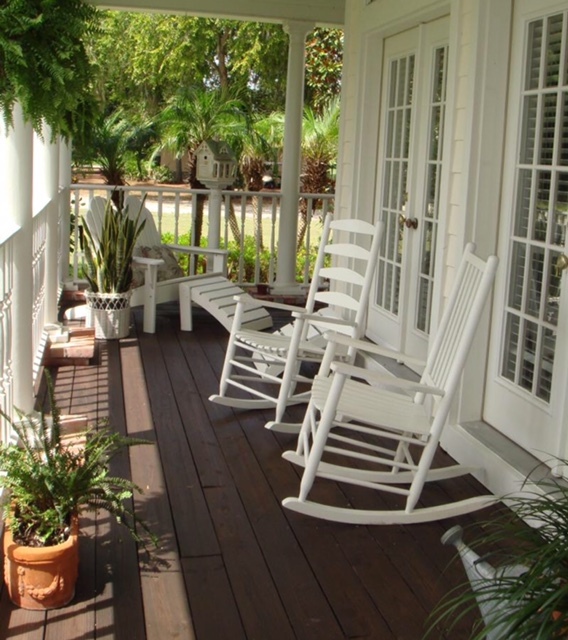 Everyone loves a good visit on the front porch. This group makes an effort to personally visit all of our visitors to Brookline with a smile and a handshake. We want to make a connection and encourage them to return to us again. Our food pantry is now filled with gift cards. We’re looking for people who can donate gift cards for this purpose. If you’re in need of food, please see us. This is a fun ministry where members sign up to be either a host or guest. The guests meet at the building before being sent off to a randomly drawn host’s house. As a host be ready for a surprise when the doorbell rings to see who is joining you for dinner. After dinner all hosts and guests meet back up at the building to enjoy fellowship and dessert. We focus on encouraging others with personal visits. We visit people in hospitals, other care facilities or at home. We’re here to help fill a financial need to our Brookline family as they strive to serve our Lord. Part of this money will be used to help offset fees many of our members have to pay to attend certain programs such as the marriage retreat, Men’s Encounter, Ashes to Beauty, Financial Peace University, youth camps, etc. We don’t want the cost of these programs to be the reason someone doesn’t attend. If you are blessed financially, please consider contributing directly to this fund. If you are in need, please contact us. When people are ready to study the Bible, we want to be there. We reach out and minister to the kids and families in foster care. Brookline Church of Christ hosts this annual holiday event for local children in foster care. Kids in care are invited to “shop”, at no charge, for gifts for their family and friends. During this event we also do crafts, a photo booth, and lunch for the foster families. This ministry handles Wednesday night meals and potluck meals after Sunday services. This ministry manages the audio/video functions of the worship services. They also manage various technologies, such as the Wi-Fi in the church building. This ministry spreads the love of Christ and brings salvation to all the world. The church office takes care of so many things it's impossible to list them here. Many of their individual ministries fall under the direction of several other categories. Will you commit to being a prayer warrior? We want you. This ministry will have specific requests to be brought before God in prayer. We want our prayer life to be intentional, focused, and persistent. Are you willing to serve in the corporate worship service? This may or may not be in the public eye. This is everything from song leader and scripture reader to nursery attendant or cleaning up communion. There are many, many opportunities to serve this congregation. If you are over 50 years of age, this group is for you. We have several activities and trips throughout the year. This is a thrift store in Springfield run by volunteers with all funds benefiting Fair Haven Children’s Home in Strafford MO. The children’s home works to provide a stable, safe home environment for kids. At Thrift Haven, we accept donations of furniture, appliances, books, shoes and all types of clothes, toys and housewares. Of course, a money donation is always accepted. Once donations come in, we sort them, price them and put them on the shelves to sell. The work is fully dependent upon volunteers. If you have 1 hour a week or 2 days a week, we can use your help. Come take a tour of the store. We also sell scrap metal and even bale card board to sell. Help us help the children of Fair Haven Children’s Home. We will meet with the bride and groom to be, show them around the church building and fellowship hall. We then are on site for the rehearsal and wedding to make sure all goes well. The purpose of the Welcome Ministry is to make all guests and members feel welcome. A friendly smile might change a negative attitude. An expression of compassion might help calm a stressed parent. A genuine welcome and conversation may help people feel a sense of connection. World Bible School is sharing Jesus with thousands of people around the world. Lessons mailed out are designed to help each student find answers directly from the scriptures. In 2017, Brookline’s 40 teachers sent out 7,379 lessons. There were 73 confirmed baptisms. Many students who obey the Gospel include friends & family in future students. Many congregations have been started by WBS students. Brookline supports Martin & Ledson Makwinja (preachers in Malawi) who follow-up with students who request to be baptized. Martin & Ledson also do follow-up teaching in the villages where our students are located. WBS volunteers are given a certain number of students, to which they mail pre-written lessons. When the student sends in their answers, teachers use an answer key to grade the lesson. This process continues with further lessons that teach the student the plan of Salvation.